Rice is just rice, right? White, brown, sticky, sweet — rice is a cheap way to fill up and keep going. Not so fast. As with any food commodified for a vast public at the lowest possible price point, rice is a lot better than that gummy stuff many of us have sadly gotten so used to. For example, there’s Koda Farms rice. The oldest family-run rice farm and mill in California, Koda Farms’ earliest iteration was established in 1910 by intrepid immigrant Keisaburo Koda, who came to the United States from Japan in 1908. Koda had wild-catted oil, founded a small chain of laundries, and established a fish cannery before moving to California’s Central Valley to begin farming, quickly becoming known as the Rice King. With the internment of 1941, the family was forced off its land, returning after WWII to discover that nearly everything they owned had been sold and they had to begin again. Which, in a breathtaking act of everyday courage, is exactly what they did. Koda must have been a remarkable man. In the 1950s, he convinced famed rice breeder Hughes Williams to work with him. “Back then, Caucasians did not work for Japanese,” says Robin Koda, who with her brother Russ now runs the operation their grandfather began. Koda Farms markets this grain as Heirloom Kokuho Rose (not to be confused with Calrose), encouraging customers to really eat it — not bury it under sauces. Doing it right and growing an heirloom that has an excellent flavor isn’t a simple choice. 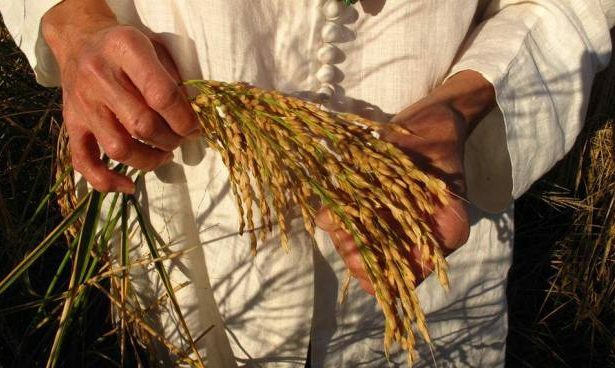 Koda makes its living off its more easily cultivated Japanese sweet rice, which we sell as a stand alone product. We include the Kokuho Rose in our Japanese Staples Set with Shichimi Togarashi, a SHED spice mix, and U.S.-made soy sauce. With its longevity, story, and focus on sustainable agriculture and excellence, Koda Farms rice is the type of product we exist to celebrate. As Robin sees it, those are the factors that will lead consumers to discover the unique taste of her family’s rice. “How do we differentiate ourselves in this sea of competitors?” she asks rhetorically. “For us, that has been to put more emphasis on the fact that this is farmed by a family and is something you’re not going to get when you a buy a bag of rice with no history that isn’t a single origin product. Our family history is fascinating. We’re here because we love what we’re doing and we’re extremely dedicated to it.